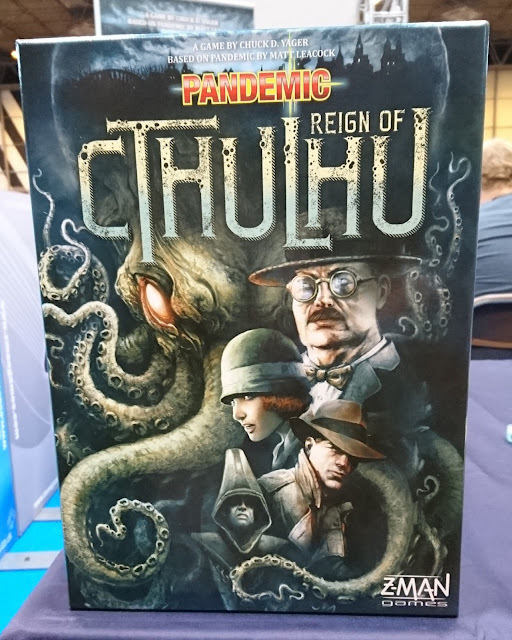 At the UK Games Expo last week I was lucky enough to get a demonstration game of Pandemic: Reign of Cthulhu from Z-Man Games and thought I'd share my first thoughts here. 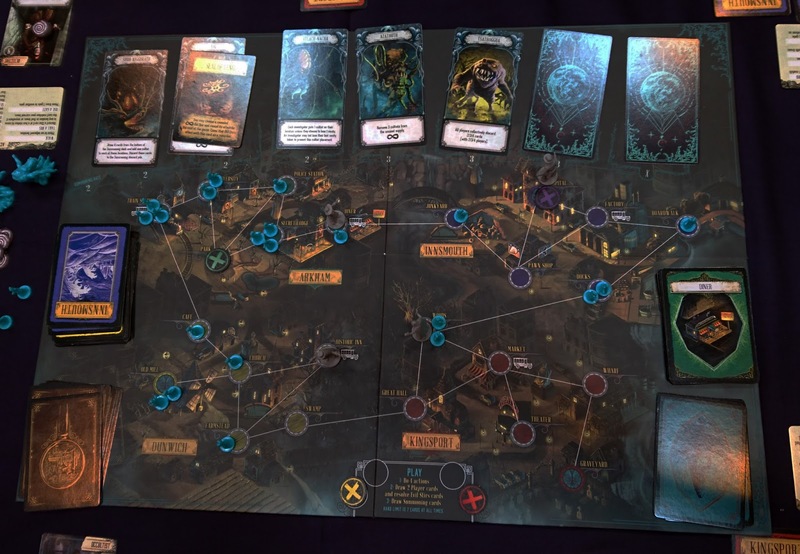 Well, actually, my first thoughts were 'Gah, another Cthulhu themed game... Oh well, at least it's not zombies', but that's not very constructive or informative! Don't get me wrong, I love the theme - it just feels a bit like everyone is busily pasting cultists, tentacles and elder-everything into their games at the moment, leading to a distinct feeling of being over-Arkham'd. For Pandemic, though, I'm willing to overlook the bandwagon-jumping. It's one of my favourite games, the first co-op I ever played and a huge part of what got me into hobby board games in the first place. 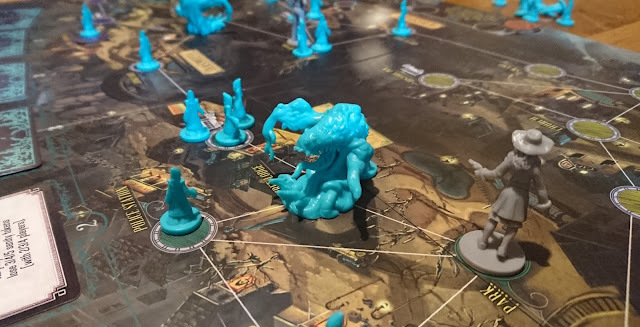 I haven't played any of Chuck Yager's games before, but the base mechanics are sound, Matt Leacock was involved in the development and it looked great on the table, so I had high hopes for Reign of Cthulhu. This latest Lovecraft-themed installment in the Pandemic series has players charging around New England to seal portals in the fictional towns of Arkham, Kingsport, Dunwich and Innsmouth that form the four different coloured regions familiar to players of the original Pandemic game. I'm going to assume you're at least a little familiar with Pandemic, here. We asked our demonstration host (from Esdevium Games) if he'd had anyone try the game who hadn't played the original version and the answer was 'no' after two full days, so hopefully that's a safe assumption! If not, there's a great run-through video by Richard 'Rahdo' Ham here to start you off. There are enough similarities to the original game to get you up and running with Reign of Cthulhu pretty quickly. Amongst the characters are some familiar roles (we quickly identified the Medic analogue!) but also a few new ones have been thrown into the mix. Being a Cthulhu-themed game, everyone also now has a collection of sanity tokens to lose in times of peril. If you lose all of them your character loses an action, their character card is flipped to the 'insane' side and their special power is replaced with a different one shown on that side of the card. To win the game you need to work as a group to seal the four gates before more evil can pour out of them. There's one in each town and you can seal it by collecting enough 'clue' cards of that area's colour, standing on the gate and spending an action to close it. Infection cubes have been replaced with tiny green cultist figures who proliferate across the board with alarming speed. It was hard to remove them without referring to it as 'curing' the location - although saying that I'm not sure what we *were* supposed to be doing - fighting? Chasing them off with sticks? Perhaps my Journalist character was more proficient in hand-to-hand combat than I suspected! A bit of a thematic oddity, there, in my opinion. Instead of periodically pulling out Epidemic cards from the deck you'll find that Evil Stirs, spawning a nasty looking Shoggoth which takes three actions to kill. Oh, and you can't go near it without rolling a dice to see if you lose some sanity in the process. Each time Evil Stirs, a new Old God is revealed on the track at the top of the board. These cards can have a one-off effect, or apply a nasty global rule to the game (like needing one extra card to close a gate, for instance). This also doubles as a replacement for the infection track. The last Old God on the track is Cthulhu and if he shows up, you lose. Being a Pandemic game, there are plenty more ways to fail! If you run out of clue cards to draw, if you all go insane, or if you need to place a Shoggoth or cultist and can't because they're all on the board, evil consumes the world and you (unsurprisingly) lose the game. I forgot to add that Shoggoths can also move! When indicated by a symbol on certain infection/'summoning' cards, they shuffle one space closer to the nearest open portal. If they reach a portal and need to move again, they disappear through and another Old God is summoned. Event cards become Relic cards, handy items that give great bonuses if you're willing to roll the sanity dice to use them. Location cards are simplified - rather than one card per location there are just four colours of card marked with each town's name. Movement is a bit different; you can walk around as normal or discard cards at bus stops to go further. Discard any card to go to any location in your current town, or discard the colour of the town you're in to go anywhere on the board. Trading cards is a little easier - you just need to both be in the same green location, say, to hand over green cards. Overall, I had great fun with the game. It's different enough, in my opinion, to warrant owning it alongside the original Pandemic and we found it really challenging. Our first game, lasting only two turns (not rounds, *turns*), was indicative of how tough it can be! The other games I played ended after running out of cultists to place, both times when it looked like we were on track to win. The moving Shoggoths add a clever new dimension to the puzzle and I really enjoyed all the other changes mentioned above. It's hard to judge anything after only two proper plays (I can't really count the first game, I didn't even get a go!) but I'd be happy to play some more. The artwork and components are brilliant, with an over-arching colour theme in one of my favourite teal-ey blues. The miniatures are great and look like they'd be quite fun to paint. I love the Lovecraft theme, although it can feel a little pasted-on in places as I mentioned before with 'removing' the cultists. Will I be buying a copy? I'm not sure yet - but the game won't be available until Gen Con in August 2016, so I've got plenty of time to decide.